Unfortunately, when hiring for sales ops positions, sometimes we hire people who have a nice personality — but not for sales ops. You see, when you are putting together a sales ops team, the character attributes and mindset of the people you hire is often more important than the skills and abilities they already have. Knowledge about analytics and your sales process is something you can teach, but it’s much more difficult to re-shape someone’s personality if they don’t have a natural affinity for the kind of work that we do in sales ops. Through our research and conversations with sales ops practitioners, we’ve come to the conclusion that nearly all successful sales ops folks share a particular character trait: flexible tenacity. Anyone who works in this field is going to run into roadblocks and failures. Sometimes those roadblocks come in the form of people who just don’t want to change the way they have always done things. Sometimes sales ops pros keep running into dead ends when investigating the root causes for a particular issue. Sometimes a new process that they recommend won’t have the intended results. A person with flexible tenacity will acknowledge those experiences and learn from them, but he or she won’t give up. These folks will look for another path, another avenue to achieve the results that they really want. If they can’t get everything they want now, they’ll take what they can get and keep working on the problem. If something doesn’t go their way, they compromise — but they don’t surrender. This mindset is different than stubbornness, which is about being so obstinate that you refuse to budge. Stubborn people often get thwarted in their plans because they can’t accept a partial victory. People with flexible tenacity are much more resilient. They can “take a licking and keep on ticking,” as the old commercial said. They accept that life will have some difficulties — expect it, even — and enjoy the process of finding a way to overcome those obstacles. Of course, good sales ops folks need a lot of other characteristics as well. We offer a pretty thorough list in the webinar How to Hire Great Sales Ops People. It also delves into the pros and cons of external vs. internal hires, as well as strategies and tactics for assessing job candidates capabilities. If you’re currently hiring or expect to be soon, you might also want to check out The Anatomy of a Successful B2B Sales Analyst. Based on extensive research, it details 21 attributes, skills and capabilities you’ll want to look for when hiring. And if you’re on the other side of the table — that is, looking to get hired rather than to hire other people — we recommend the webinar on Advancing Your Career in Sales Operations. It explains how to develop or acquire the traits that hiring managers are looking for, in addition to offering tips for making sure your contributions get recognized. For transforming Sales Ops, good intentions aren't enough. You need a plan. 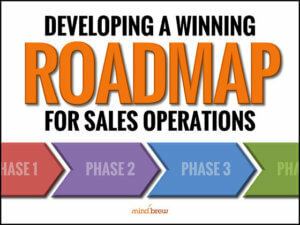 In this on-demand webinar, learn about creating an effective roadmap for making Sales Ops a more strategic function.